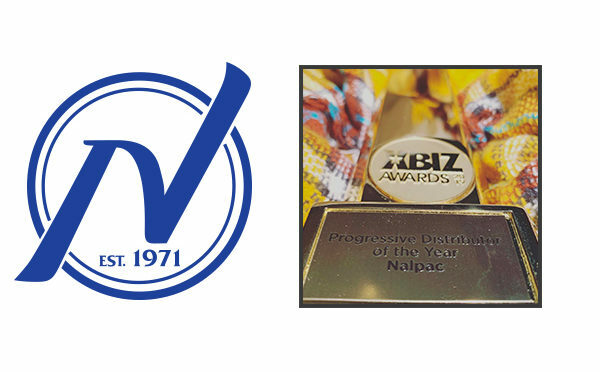 FOR IMMEDIATE RELEASE — February 6, 2019 — FERNDALE, Mich.– America’s leading adult distributor, Nalpac (www.nalpac.com) is pleased to have received two prestigious awards during the 2019 XBIZ Awards shows including the 2019 XBIZ Award for Progressive Distributor of the Year and Nalpac CEO Steve Craig won at the 2019 XBIZ Exec Awards for Chief Executive of the Year. Nalpac took the trophy for Progressive Distributor of the Year back to Detroit with the companies first ever XBIZ win at the 2019 XBIZ Awards. In just under two years of new ownership, Steve and Andy Craig have transformed an aging business and turned it into a progressive, innovative, technology-driven distribution powerhouse. Now operating out of a new facility in Ferndale with modern features, an open office floor plan, custom showroom, and close to 200,000 square feet of warehouse space, Nalpac’s plans for continued innovation and growth are showing no signs of slowing. “We are honored to win the 2019 XBIZ Award for Progressive Distributor of the Year. We have spent countless hours this year focused on building tools to help support our retail customers while also offering our manufacturing partners unique marketing, branding, and sales opportunities. Now in our new facilities, we have the capabilities and manpower to offer a full range of distribution, fulfillment and marketing services which set Nalpac apart from our competitors” said Andy Craig, Nalpac COO. In 2018 Nalpac released the first-ever mobile app for adult retailers. With the Nalpac Mobile App, retailers have an easy to use, handheld resource to place orders, or access account information. The Nalpac Mobile App empowers busy retailers to place orders directly from their mobile device, including while on the retail floor. Retailers can search for items by scanning any UPC, entering Nalpac or manufacturer part numbers or simply searching by keyword. Users can build a cart to place an order in a matter of minutes or create one or more “shopping lists” to later view, change and ultimately order. This Nalpac Mobile App has reinvented the once complicated ordering hassle for Nalpac retail customers. The Nalpac Mobile App is available at the Google Play Store and the Apple app store for iOS devices. Nalpac CEO Steve Craig was the big winner for Chief Executive of the Year at the 2019 XBIZ Exec Awards in an exclusive ceremony during the 2019 XBIZ Show in LA. Winner for Chief Executive of the Year is recognized and defined by XBIZ as “The most demanding and responsible person in a company must not only oversee every aspect of an enterprise but must also serve as its vision. The buck truly stops at this desk.”. “I am very humbled to be acknowledged by XBIZ and my peers as the 2019 Chief Executive of the Year. The award may have been presented to me, but it truly recognizes the accomplishments of our team. We are grateful for the customers who support us and the brands we are privileged to represent.” said Steve Craig, Nalpac CEO. Nalpac customers can now place orders using the Nalpac Mobile app or by contacting their Nalpac sales rep with any questions. New Nalpac customers can email sales@naplac.com to get an account set up. To sign up for the Nalpac email newsletter and take advantage of significant savings, special promotions, and sales, please visit the Nalpac blog at www.nalpac.us. Nalpac offers over 20,000 items to a wide array of retailers at wholesale price. For more information on Nalpac, please visit the company website www.nalpac.com. Follow Nalpac through social media for giveaways and daily updates on Twitter @NalpacWholesale, on Facebook www.facebook.com/Nalpac and on Instagram @Nalpac.